I thought about Wendell Berry when I saw the tree pictured on the right. My neighbors grieved for the large Beech tree that fell across the road. It had been a land mark for years. It fell because it had ended its cycle of life. As it aged, it rotted from the inside out, as many trees do. Foresters tell me that many trees would be better served to be harvested in their prime. 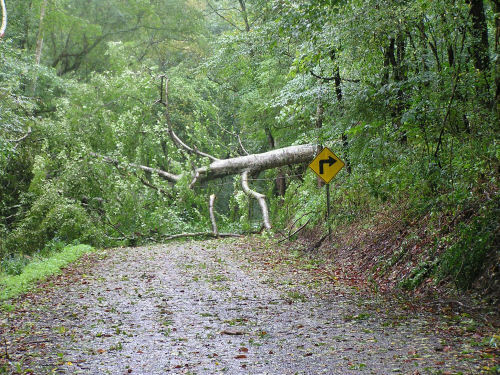 In a wooded area such as ours, falling trees can be a nuisance. But having lived in Texas for 10 years, I can’t help but remember the times when I wished I had trees that were taller than I am. Animals have a similar cycle. Part of the responsibility that comes with keeping animals is knowing when to let them go. They can’t tell you that they hurt or can’t see or have lost their status in the group, but a good keeper learns to see the signs. While not all farmers name their animals, it shouldn’t take a tag or a chip to know one’s animals. That also adds a touch of pain when it’s time for an animal harvest. Sometimes we put it off because we can, but we probably shouldn’t. Farms have life cycles, too. Many have been run down through modern agriculture’s excess use of petrochemical products. But nature has a way of over-coming our abuse. Every week I am reading stories of small farms that are regenerating through proper cycling of plants and animals, using sustainable methods and one-hundred year old wisdom. If you have ever wondered whether your plants and animals want to communicate with you, then you might enjoy reading Stephen Buhner’s “The Secret Teachings of Plants”. Once you get past all of the “rational mind” discussion he has to do to get you to consider using another sensing organ, the heart, a new array of possibilities opens up. Don’t try to discuss this with your friends because you’ll end up sounding like a California Granola eater. I should just do a “Wendell Berry” page. Amazon has his extensive body of work in one place.The man is marvelous and this one recommendation doesn’t do justice to his accomplishments. I have read most of his writings from essays to fiction and I believe he is a true American treasure. Kentucky farmer and noted poet Wendell Berry understands the circle of life that good farms demand. “In our relation to the land we are ruled by a number of terms and limits set not by anyone’s preferences, but by nature and by human nature. I. Land that is used will be ruined unless it is properly cared for. II. Land cannot be properly cared for by people who do NOT know it intimately. III. People cannot be adequately motivated to care for land by general principles. IV. People are motivated to care for land to the extent that their interest in it is direct, dependable and permanent. V. They will be motivated to care for the land if they can reasonably expect that their children and grandchildren will live on it. VI. There is a limit to how much land can be owned before an owner is unable to take proper care of it. This book is worth your time. It is even worth stealing some time from work, church or hobby to get to read it.